(Newser) – Three people were killed and at least 11 injured this morning in a bizarre car crash in the most politically sensitive patch of China. 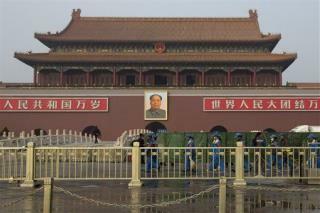 Police say an SUV plowed through a crowd in Beijing's Tiananmen Square and caught fire, crashing almost directly in front of the huge portrait of Chairman Mao in front of the Forbidden City, Reuters reports. The three occupants were killed and 11 tourists and police officers were hospitalized. This doesn't sound like a protest, this sounds like an accident. if those journalist were smart you can actually undelete those images with a PC and the right software. Chairman Meow looks like the Chinese version of Curly from the three stooges. As much as China has "progressed" they still hold onto the old tyranny of the past.